and fit in excellently with Snog’s modern and stylish look. Snog is a chain of frozen yogurt shops with a vision to create delicious treats using only the healthiest and freshest ingredients. 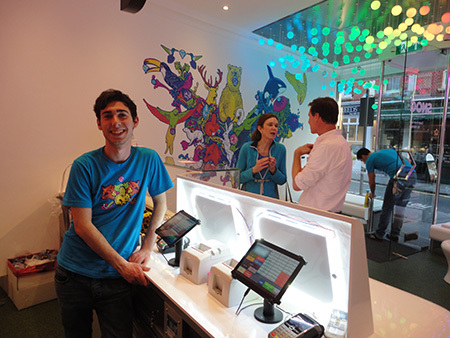 The first Snog outlet opened in 2008 in Kensington, South London. 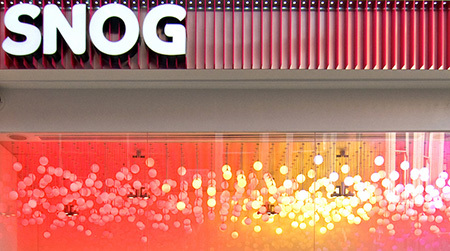 Within 5 years the Snog concept has spread to three continents, with Snog shops opening in locations around the globe. Second in importance only to their product is the style and atmosphere of their shops. 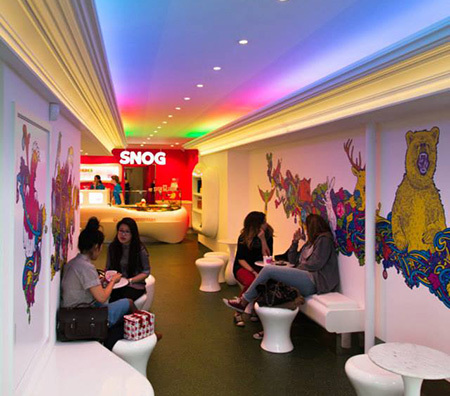 On the cutting edge of interior and graphic design, Snog aims to deliver an exciting and original customer experience. Snog were looking for a point of sale solution which would be efficient and easy to use, so customers could be served as quickly as possible but that was also stylish and elegant to fit in with the contemporary design of their outlets. Before deciding to look for a new EPOS solution Snog were using 15″ touch terminals, which are large and «clunky» and did not fit in with Snog’s sleek and modern design aesthetic. Snog’s existing solution offered no possibility to include a customer display, showing a complete receipt and promotional material. Also, the lack of a cloud back office meant that there was no facility to see instant sales reports and that much of the sales data could only be accessed ‘on site’. Getting updated product information and prices to each till terminal was an inefficient and time consuming process. Snog needed a solution which could solve these problems, and which could easily be expanded and adapted to new shops and potential franchises. A solution was designed using stylish and compact Android tablets as point of sale terminals. The tablets are fixed to the counter by a discreet yet secure stand. The terminals take up very little counter room and fit in excellently with Snog’s modern and stylish look. Stores now have the option of fitting a second tablet to each till point, displaying to the customer a full description of their order as well as receipt information, or promotional material which Snog can update and relay to the tablet as often as they wish. AlfaRichi’s cloud based back office software means that changes can be made to Snog’s product list or pricing plan and from any computer. These changes can then be sent to Snog’s network of till with a single click of a button, and these updates can be in place virtually instantaneously. Conversely, sales information and reports can be accessed at any time, from any device with an active internet connection.